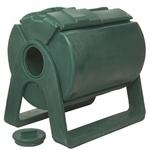 Compost Tumbler Units | Free Shipping and Handling! 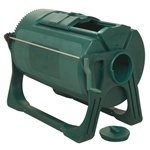 A compost tumbler is a great way to get started composting at home! Compost tumbler bins like the ones shown here will produce finished compost in about 6 weeks, under the right temperature and moisture conditions. Compost tumblers also produce little to no odor. Composting is a great way to recycle your garbage like kitchen scraps, yard refuse, and other organic matter into valuable compost that your plants will love! For more information, please visit our Compost Tumbler FAQ page. For more great products for your home and garden, you've come to the right place! Home Products 'n' More offers a variety of unique products that gardeners and outdoor enthusiasts will love. For example, we have a category of outdoor lighting that is sure to help you light up your outdoor living areas at night. Choose from low voltage or solar lighting options. We offer lighting that can be used in your landscaping or gardening edging, or lights that can be affixed to post caps on a deck or fence. These lighting options are great for pool areas, decks, patios, or any outdoor living area where you want to create a lovely ambiance during the evening hours. You might also be interested in our category of wooden garden furniture. We offer weatherproof furniture for your deck, patio, or garden area. Many of our wooden garden furniture pieces are constructed of log cedar, an attractive and rustic material that is also long lasting and durable. Cedar is naturally pest resistant and can be stained or painted to match your deck. You can also leave cedar garden furniture unpainted and it will naturally weather out to a gray color over time. We offer a variety of furniture options such as chairs, swings, gliders, end tables, love seats, and more. Best of all, you'll get free shipping and handling on all outdoor furniture from Home Products 'n' More! That's right, you can order as much as you want, and the shipping charge is still on us. If you have questions about any of the items you see on our website, please feel free to contact us. We're happy to answer questions, provide ordering assistance, or check on the status of an existing order. We look forward to hearing from you!